Looking for private in-home or in-studio Trumpet lessons? Our Coppell teachers are ready to get you started. Find your teacher today! I've been playing trumpet for 18 years, and I'm anxious to pass along my love for the instrument to others of all ages! I teach a variety of styles with my experience performing many kinds of music from classical to hip-hop. Whatever your interests I can get you playing with a healthy approach to brass playing and solid fundamentals! Caleb moved from his hometown of Wichita, Kansas, to Chicago in 2008 to attend DePaul University, where he received his Bachelor’s in Trumpet Performance studying under Matt Lee and Tage Larsen. Since then, Caleb has picked up a variety of regular gigs across a wide spectrum of styles, genres, and types of events. Caleb performs in Chicago with soul-pop band The Right Now, the progressive Pocket Radio, the soulful Bassel and the Supernaturals, the genre-defying Willy Dynomite, the Latin-grooved Contrabanda, and funk outfit Nasty Snacks. He has played in horn sections for Latin, funk, and big-band jazz bands, as well as Afrobeat, indie rock, R&B/soul, and hip-hop/rap groups. et in symphony orchestras, pit orchestras and in the DePaul Screamin’ Demons Pep Band at Madison Square Garden. Caleb also regularly lends his solo talents to wedding parties and church services, and is one-fourth of the Chicago for-hire horn section Revolution Horns. Other musical endeavors include a performance on the Steve Harvey Show, playing trumpet for the Broadway musical I Love Lucy in downtown Chicago, and a coveted chance to perform in master classes for his idols Adolph “Bud” Herseth and Chris Martin. Caleb has been teaching privately in the Chicago area for 6 years now and is eager to teach students with any amount of experience, especially those who are eager to approach music from a variety of perspectives. 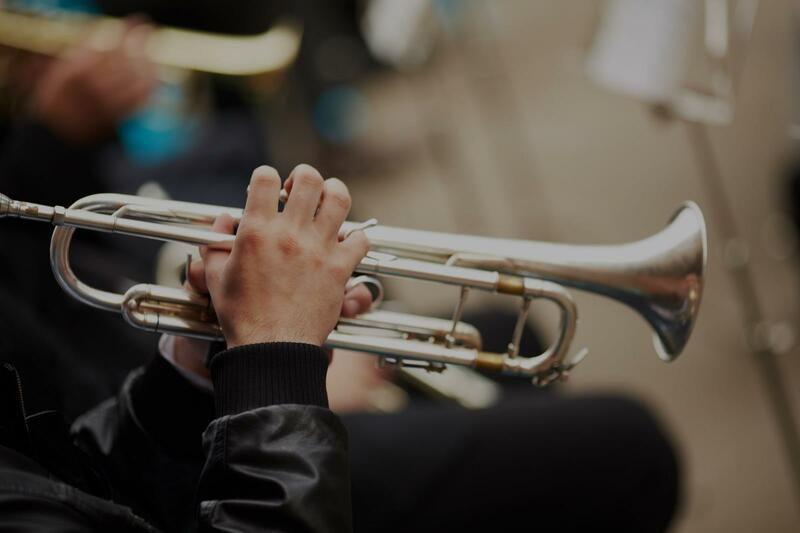 I believe that the best way to teach a brass instrument at any level, is simply to check in and make sure that the student has a great understanding of what a beautiful sound is on their instrument. This is done in a patient and positive environment, filled with the best possible music making to serve as a model to aspire to. With small, attainable goals and encouragement to practive at least a small amount on a daily basis, you cannot help of improve, and hopefully have a good time playing whatever music interests you while doing so. The journey is a bit different for everyone, but anyone can make a beautiful sound, and go from there! I like to strike a balance of teaching out of various method books(depending on the student and their level of ability, some are more suitable than others of course and I help guide the way), and learning to play by ear, which can be almost anything the student wants to learn, provided it's not overly complicated for them. Technique has it's place, but is certainly not the whole story. Learning music that is fun, while at the same time learning to get better at your instrument, makes the overall process enjoyable and rewarding. Once you have the right tools, music is something that can be fulfilling for the rest of your life, especially when you learn to do it in a fun and healthy way. Great first lesson and looking forward to more! Caleb is a very insightful teacher. Caleb was very patient with me and I appreciated that. I was a good lesson. Over 20yrs of professional trumpet education and performing. I am a lover of music and have been stressing the importance of music education for over 10yrs. I was born to a musical family and a father of two who holds a Bachelor's of Arts in Music and obtaining a Master's in Jazz Pedagogy. I am a very laid back teacher but stresses individual practice and becoming a versatile and well disciplined musician. I utilize many methods of the suzuki method to instill the importance of ear training and making sure that every student has an opportunity to learn and musically express themselves. After months of studying with me the student will have retained necessary technique,basic understanding of musical concepts, and executions as well as an avid appreciation for multiple musical styles. I teach beginner trumpet. I can help students learn to read music, play with good tone and technique, learn valve combinations (fingerings), and play from a book or school band music. I've been teaching private lessons for over 15 years. I was a high school music teacher & band director in the Philadelphia area for 7 years, and I now live in Miami, FL where I am working on a doctoral degree in conducting. I also work as a freelance musician. I'm looking forward to making music with you! Your lesson specifics are up to you! If you know what you want to learn, I'll help get you there. If you don't know where to start, I can lead you through the fundamentals and help you set goals. I like to keep things positive in music lessons. Music is, after all, for fun and enjoyment! I like to blend teaching technique and musicianship, while keeping things fun. things you've been working on, expand your musical experience, and help you reach your fullest potential as a musician. Online lessons are a wonderful option! I am flexible with scheduling and allow changes up to 24-hours before a scheduled lesson. My home studio has chairs, music stand, and areas for parents to sit in on lessons. Garage band is available for recording. Students need an instrument and books. Best teacher ever. Very patient. She is great teacher. I can't wait next class ! Trumpet is a wonderful instrument for both the young and young-at-heart. I have been playing trumpet for most of my life, and teaching it for 14 years. I am a 2008 graduate of the University of North Texas with a Bachelor of Arts in Music degree. While at North Texas I taught trumpet lessons in the Denton area. I have also taught piano, clarinet, and saxophone as well as all the other brass instruments. I have performed with the UNT Concert Band, the UNT Brass Band, the UNT Nine O'Clock Lab Band, the Collin County Jazz Band, and the San Jose Metropolitan Band. Currently, I teach clarinet, saxophone, trumpet and piano in the DFW area. I also play trumpet in the both the Frisco Community Band and the Frisco Community Brass Ensemble. I am a laid back teacher who gets you playing from the first day. et any books that we play through (but I'll give you time to get them, so don't worry.) Any books that we use will be easy to find and won't cost a whole lot of money. I will always bring my instrument with me when I attend a lesson, so I expect my students to do the same when they come to my studio. Also, make sure you have any books and music that we will be playing out of. I always have a copy of anything that we are playing, so I expect the student to have a copy as well. Is possible to change teacher? Not satisfy this teacher ! my daughter loves her lessons with Ms Tammye! I have a wealth of experience as a trumpeter and music teacher, and hold three degrees in music: DMA from Univ. of Georgia, MM from UT-Austin, and BM from N. Dakota State Univ. I am trained mostly in and play primarily "classical" trumpet, but have experience performing and teaching jazz and pop/commercial styles. Working with kids and adults on music is enjoyable and fulfilling, and I strive to help students as much as possible. My name is Chris, and I have been playing trumpet for over twenty years. I grew up in the TX public schools and was a two time TMEA All-State Musician. I hold three degrees in music from accredited universities: DMA at UGA, MM at UT-Austin, BM at NDSU. I enjoy teaching and helping others, and have a patient, kind approach to working with people. Music is a wonderful gift that we can all share in, and I am happy to pass on what I have gained from my musical experiences. My son is a high school senior taking lessons from Dr. Heldt. The lesson went very well. My son is very happy to have such a kind and experienced teacher. So glad we found him! My lessons create a fun and motivational learning environment that promotes goal setting, good habits, positive self esteem based on tangible accomplishments, and an appreciation for the rewards of diligence and perseverance. My services include music lessons in trumpet, jazz improvisation, music theory, jazz theory, and audition preparation. I am currently the Principal Trumpeter in the Lyric Opera of Chicago Orchestra, Assistant Principal Trumpet with the Grant Park Summer Music Festival Orchestra, Principal Trumpet with the Chicago Philharmonic Orchestra, and former Assistant Principal Trumpet with the Alabama Symphony Orchestra. I have performed with the Chicago Symphony and Milwaukee Symphony. I Hold a Doctorate of Musical Arts degree from the University of South Carolina and I am a certified band director with 5 years band directing experience. Sibiu Philharmonic in Sibiu Romania. More recently he performed as guest soloist at the National Brass Band Competition Gala Concert. Mr. Denton was a fantastic teacher! We worked on articulations and phrasing in the first movement of the Halsey Stevens Sonata and he was able to bring a lot more out of me musically than I thought I was capable of. He made excellent use of the 30 minute online lesson and I came away feeling more confidant as I approach my recital. I studied with Bill in college and he is the best of the best. Highly recommend. Bill Denton has a wealth of knowledge and a great personality. He knows exactly how hard to push you as a student and balances it with plenty of positive feedback. It would be wise for students to take this incredible opportunity to study with a principle trumpeter of a great orchestra. "Tammy has enough patience for the least attentive learners." Dallas, TX teacher: Matthew S.
er. So glad we found him!" Dallas, TX teacher: Chris H.
"She is Awesome! I highly recommend her. My son took only an hour and a half class and i see a big improvment. Thank you Tammye!!!!!"